Where the patient experience matters! First to listen, then deliver compassionate care above our industry standard. To become an efficient patient centric comprehensive primary care clinic. Listening Doctor is for people of any age, and at any stage in an illness, whether that illness is curable, chronic or life-threatening. Respect – Practice respect for each patient and staff member. Value – We deliver value based care to all patients. Efficiency – Aim to deliver care in a very efficient way. Compassion – We care for our patients the way we want to be cared for. Marlene S. Moulton, MD is a practicing Internal Medicine physician located in Fort Myers, Florida. 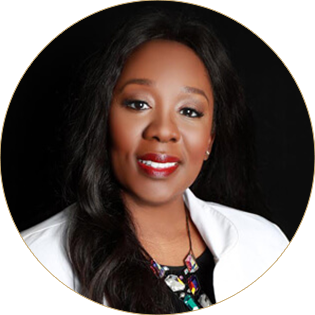 She has over 15 years of medical experience commencing with training at Meharry Medical College, and Vanderbilt University in Nashville Tennessee. She then went on to pursue training in Otolaryngology [ear nose and throat] surgical residency at the Mayo Clinic in Rochester Minnesota, and completed her final training in Internal Medicine at the University of Miami Jackson Memorial Hospital, in Miami Florida. Her areas of expertise of medical treatment are in the management of diabetes, high blood pressure, heart disease and thyroid problems. She is excited about wellness and anti-aging and has continued to utilize her Mayo Clinic surgical training to offer aesthetic procedures such as vampire facelift, botox and bio-identical hormone replacement therapy. Dr. Moulton is passionate about the delivery of medical care to her patients and understands that the patient experience is the most important part of care delivery. She also believes that patients know their bodies best! She is aware that when she listens to the patient long enough the patients assist best with the plan for care. This concept gave birth to the Listening Doctor style of medical practice. You know your body best, you speak we listen. Join us at the Listening Doctor Internal Medicine Clinic and let your medical concerns be heard and met with an active plan of care. Marlene S Moulton, MD graduated from Meharry Medical College, Nashville, Tennessee in 2003. Marlene S Moulton, MD went on to complete residency in Otolaryngology and General Surgery at Mayo School of Graduate Medical Education. Marlene S Moulton, MD further completed residency in Internal Medicine at Jackson Memorial Hospital. Marlene S Moulton, MD is board certified in Internal Medicine by American Board of Internal Medicine and also holds FL State Medical License. Marlene S Moulton, MD is currently accepting new patients. Angela is a Board certified Nurse Practitioner who takes pride in primary care clinical expertise. She has over twenty years of nursing experience. She is skilled in health promotion, disease prevention and managing acute and chronic disorders and diseases. She is motivated to encourage and challenge patients into wellness through healthy eating choices and fitness. She takes pride in providing an in-depth patient experience. Her goal is to help patients become healthy, happy and wholesome. Angela works together with Dr. Moulton to ensure that patients receive the most thorough care. She also provides an added interested in orthopedic problems including osteoarthritis, osteoporosis, and therapeutic intra- articular injections. Angela attended Florida Gulf Coast University where she graduated with a Masters of Science in Nursing. BSN: Nursing degree: Liberty University. CPAN: Certification in Peri-anesthesia Nursing. ACLS: Advanced Cardiac Life Support. BLS: Basic Cardiac Life Support. FNA: Florida Nurse Association & FNPA Florida Nurse Practitioner Association. AANP: American Association of Nurse Practitioners: Board Member. CCNPC: Collier County Nurse Practitioner Council. FMTC: Former Board Member: Fort Myers Track Club.